ODESZA live a life that every college-aged producer dreams of. Harrison Mills and Clayton Knight met their freshman year at Western Washington University and began collaborating together just before they graduated in 2012 under the name ODESZA. 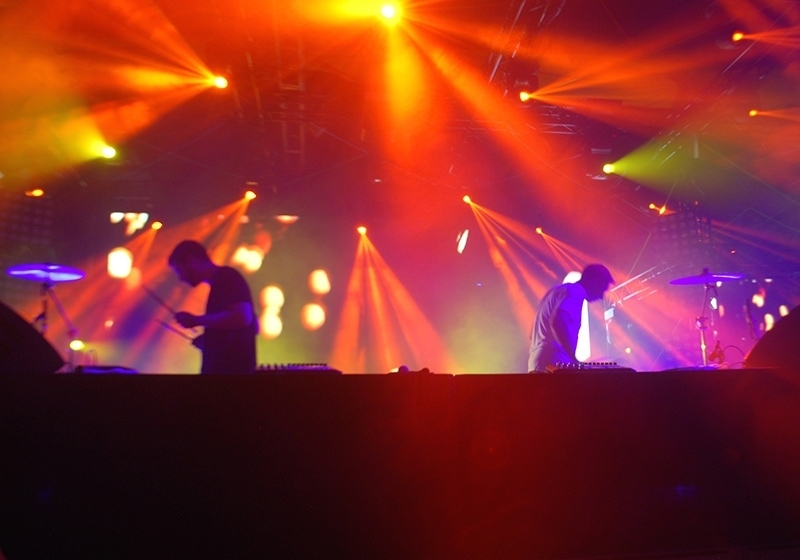 After gaining a reputation in the underground scene for their eclectic sound and releasing their debut album in the fall of 2012, the duo quickly rose to prominence when they were asked to tour with Pretty Lights. Fast forward just three years, and SLUG is sitting with Mills and Knight in New Orleans, where they would play a live set in front of thousands of people in just a few hours before jumping back on a plane to perform at SXSW, but they were cool enough to give us a few minutes to just sit and chat during the BUKU Music and Art Project. We sat on the media room futons, all of us mesmerized by the light fixtures sitting on the table in front of us made entirely of tapes that had been stacked into a cube using zip ties. Knight and Mills were laid back and made me feel comfortable about the fact that I’d met them less than two minutes before and would now have to ask them a bunch of questions about their job—something that never really gets easier no matter how many times you’ve done it. They were friendly in nature, and as a band began their set in the next room and made the walls shake a bit, we began our conversation. SLUG: Is this your first time in New Orleans? Harrison Mills: We’ve only been one other time, but we had a really fun time. I forget where exactly we were, but it was downtown. It was a good time. SLUG: Have you been able to do anything since you’ve gotten into town this time? Clayton Knight: We just got in today. SLUG: Cool, well this is a really awesome festival. Mills: Yes. The lineup is awesome. SLUG: I know! Die Antwoord played last night. Knight: Yeah, how was that? SLUG: They were really cool. I didn’t have any expectations because I had never seen them before, so they blew me away. But I’m excited to see Porter Robinson tonight. Mills: Oh yeah, we’re gonna check that out. I saw him with Giraffage in Seattle. SLUG: Awesome, so I know you just finished a tour, but it looks like you have a lot of shows coming up. Mills: Just festival shows—we’ll do SXSW and then have a couple weeks off, then Europe and Coachella. Knight: It’s kind of never ending. Mills: It’s all one big blur. SLUG: SLUG is based out of Salt Lake. Have you ever played there? Mills: Yeah, we have a lot of friends out there. It’s one of my favorite places to play because the crowd is really rowdy. SLUG: Have you ever played at Red Butte Garden before? Mills: No, every time we’ve played at Urban Lounge. Knight: It’s a fun spot. It gets rowdy in there. SLUG: Yeah, we do a monthly show there called Localized! Are you planning anything special for your big festival appearances? Knight: We’re definitely trying to make some surprises happen but nothing we can say yet. SLUG: Cool. What I loved most about In Return was that every track was so different, but each fit really well with one another. I think that’s hard to do without sounding too busy or like you’re not sure which direction to take as an artist. Was there a big process in how you chose which songs to feature on the album? Mills: I think it was kind of the number-one driving force—we love so many different things and tried to mash [them] into one big melting pot, but [we wanted to] do it tastefully and not have it feel like it’s forced. SLUG: Did you throw away many songs in the choosing process? Mills: That’s usually when we throw away a song—if it doesn’t feel like it’s meshing well. Knight: We like so many different genres and styles. We’re kind of all over the map, and that’s kind of how we make music, too. SLUG: And how do you incorporate that into your live show? Knight: It’s set up with two Ableton Live sessions that allows us to kind of control individual pieces of each song so we have it all stepped out into little pieces. I control all of the drum and bass, and he [Mills] controls all of the top lines, and we can kind of mix and match different elements of every track that we’ve made. We’ve also added some live percussion and live drumming. SLUG: So it’s live, not so much a DJ set. Knight: There’s a lot going on. We try to keep the energy up and do all styles of electronic music in our set, from heavy dance to more laid-back, hip-hop stuff. SLUG: Is there anywhere you haven’t played before that you really want to? Mills: I’m really looking forward to the Red Rocks show. SLUG: Red Rocks is really cool. You just launched your own label called Foreign Family Collective; can you tell us about that? Mills: The first artists we put out were Troy Samuela and Monsoonsiren, two people we’ve been fans of a long time. We collaborated with Monsoonsiren on our last album. Basically what happened over the last few years was that we just kept meeting people that we thought were being pushed under the rug because the market is so saturated. We were hearing incredible music from these people that just didn’t have an audience, so we tried to take our time and develop a team of people that just didn’t have an audience yet. That was kind of the driving force, but we like so many different pieces of art just like we do in music, so eventually we’d like Foreign Family to be a lot of things including stuff with video and festivals and showcases. SLUG: And how will Foreign Family Collective look aesthetically? You seem to focus a lot on artwork with your own stuff, so will the label have a specific style in that sense? Mills: Musically, it will be a lot of different stuff, but artistically, right now, our look is kind of based around architecture and a lot of black and white photography, but in the future we will probably expand. Over the next few months, Odesza will be hitting up nearly every festival in the US, from Ultra to Coachella with small shows in between before they embark on a world tour across Europe and the US—a total of 41 shows in 12 different countries (many of which are already sold out). Their latest album, In Return, is available on iTunes for purchase and acts as more of a compilation of their best works rather than an album full of one, similar sound. Characterized by more ethereal beats with occasional drum and bass and soothing vocals, their music is closer in similarity to artists like Grimes if she collaborated with Beats Antique and Porter Robinson and doused the product in Nag Champa (they didn’t smell like this, I just feel like I want to burn incense and do some yoga after hearing their music). 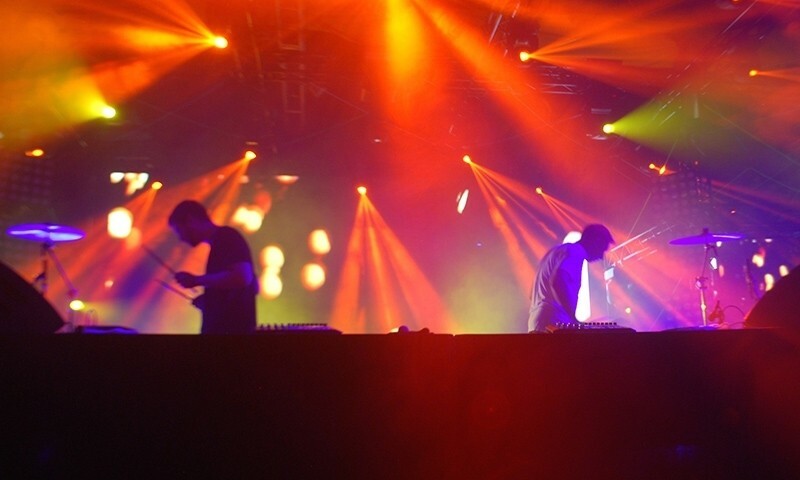 The duo will be stopping in Salt Lake on May 27 to play at Red Butte Garden with Chromeo and Classixx, but in the meantime you can read up on a review of their BUKU show from myself right here.